Accounting Best Practices – What Are They? Measure: Track your actual results. Monitor: Compare the actual results to the desired results. ♦..Revise your goals or desired results based upon your new level of knowledge. 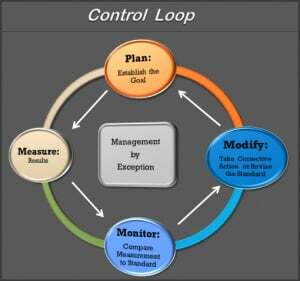 This 4-step ‘Control Loop’ process becomes an ongoing, recurring process that can be applied to all aspects of your business operations. You can use these critical elements to build your accounting system in a way that promotes internal and external tracking. You’ll be able to design systems that allow your business to continually establish, and intelligently meet, your profitability goals – or (worst case) you’ll be able to discover how to modify operations, expectations, or pricing to get back on track. If you establish a logical, organized Chart of Accounts, you will be amazed at the quality of company-level account-based management reports that you’ll be able to see. Then use the QuickBooks budget feature to enter desired results and compare budget (goal) to actual (measured results). Voila! There’s one control loop in place. Use the QuickBooks job-costing features to establish job stages in your Item List, enter estimated job costs and income for each job, and then post costs by job and job stage. Use the Estimate vs. Actual Job Cost Reports to monitor results as job costs progress, so that you can take corrective action while the job is still in process. Additionally you will learn how to refine your estimating process for the next job. Another set of controls – that can have a BIG impact on your profitability – is now in place. You can utilize the Purchase Orders feature to set standards and expectations for your subcontractors and materials suppliers. It helps YOU to clarify exactly what you are purchasing (which can help to reduce errors or misunderstandings), and holds your vendors accountable. When you convert your PO into a Bill, you have an instant control to guard against cost over-runs from vendors, and you can also monitor the Estimate vs. Actual Job Cost Reports to be sure that nothing has slipped by (control loop #4). If you have inventory, use that feature set (available in Enterprise and several of the QuickBooks Premier versions) to implement and inventory control system. Track current inventory levels, what’s on Sales Orders, what’s on Purchase Orders, what’s been purchased at what cost, number of units, which assemblies have been built, and so on. When inventory parts or assemblies are sold, their true cost is assigned to jobs –so you’ll be able to monitor your job costs and profitability. Then, when you measure what’s actually on hand – via inventory counts – vs. what’s on your books, you’ll quickly be able to spot any variances. Use this information to track down problems (control loop #5). Now it’s up to you – and we know you can do it! Be sure to watch the home page ‘Cost of Chaos’ video to see an example of just how dramatically an enhanced accounting system can impact your profitability!